The Belfast Giants are into Sunday's final of the Elite League play-offs after beating the Fife Flyers 1-0 in a tense semi-final in Nottingham. Kevin Saurette was the hero with the only goal of the game, coming at 47:42, while netminder Stephen Murphy made 24 saves for the shutout. 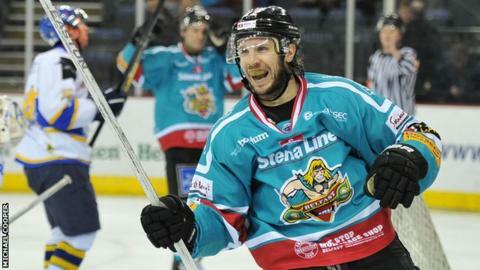 The Elite League champions will have the opportunity to go for the 'double' in Sunday's final. Sheffield Steelers beat Braehead Clan 3-2 in the other semi-final. The first period was a tight affair with the Giants having to kill two powerplay opportunities for Fife and then failing to convert on their only spell with the man advantage. Both netminders, Murphy and the Flyers' Kevin Regan, were on top form matching each other save for save as the game went into the final 20 minutes still scoreless. The game-winning goal came from a face-off win by Evan Cheverie and a snapshot from Saurette that beat the unsighted Regan. It was his 39th goal of the season and sixth in seven games against the Flyers this season. The Giants survived a frenetic finish with Murphy making two big saves in the closing seconds to secure the win.